In 2007, Dr Peter Breedt initiated and co-ordinated the first KwaZulu Natal Doctors in Art Exhibition with a group of about eight artists, all in the medical profession. 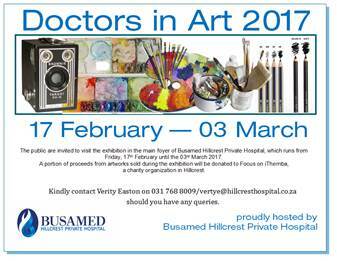 Three years ago, after a break of three years, Hillcrest Private Hospital was proud to host the 2013 Doctors in Art exhibition. This has now become an annual event with the list of artists from various medical fields growing each year. The talented artists, all medical professionals – general practitioners, specialists, physiotherapists, pharmacists and nurses – are painters, sculptors and photographers, from the Highway, greater Durban area, Pietermaritzburg and as far inland as Hilton. The public are invited to visit the exhibition in the main foyer of the hospital which is open from Friday, 17th February until the 3rd March 2017. A portion of proceeds from artworks sold during the exhibition will be donated to Focus on iThemba, a charity organization in Hillcrest.